Classic boater also know as, basher, skimmer, cady, katie, somer, sennit hat sharp features, The boater was the trademark hat worn by famed French performer and movie star Maurice Chevalier. He very often wore it when performing on stage, along with a tuxedo. In the book Harry Potter and the Philosopher's Stone, in the third chapter, Smeltings' boys wore straw boater as a part of the school uniform. 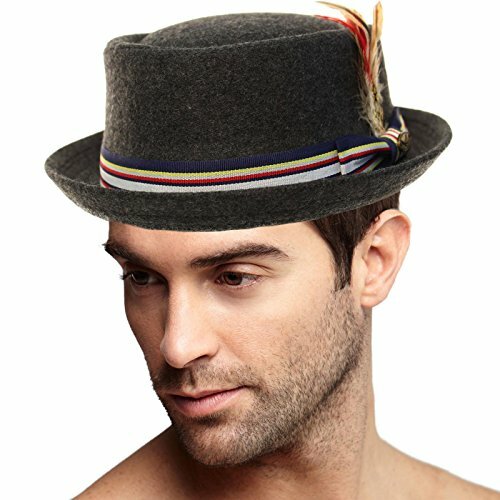 Also, known as: The first hat to be called a pork pie was a hat worn primarily by American and English women beginning around 1830 and lasting through the It consisted of a small round hat with a narrow curled-up brim, a low flat or slightly domed crown with a crease running around the inside top edge, and usually with a ribbon or hatband fastened around the shoulder where the crown joined the It was often worn with a small feather or two attached to a bow on one side of the hat. Classic, grosgrain ribbon hatband bow with curled snap up stingy brim. Interior sweatband, luxurious interior lining for comfort. Premium quality, Perfect for any season. Great for both men and women. Vacation or resort wear or a night on the town. Occasion: Classy flat top topper fedora, pork pie, boater fancy sun hat, everyday wear. A day or night out on the town, pair off in a suit, tuxedo or just jeans, all outdoor activities for sun protection. Formal party attire, wedding, bachelor party, cocktail party, plays, church and religious gatherings. Kentucky Derby, horse races, charity events. Perfect for vacation and cruise attire.